You are here: Home / All Freebies / Time to Get Those Math Brains in Gear! Are you looking for a different way to review first grade math skills? If you’re tired of using (and correcting!) 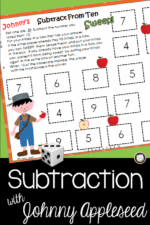 papers and want an activity that will keep your students engaged as they practice, here’s a math game that you’ll want to try! Here’s how Thumbs Up math games work. Each card in this sample game for reviewing first grade math contains an expression for the players to solve. After solving, they must decide whether it’s true or false. For example, is this math expression thumbs up true or thumbs down false? 80-70=20. How about this one? 6+3>2+1 Can your end-of-year firsties or new second graders solve these? Sorting activities that require your students to solve completed expressions like these are an effective way to practice math skills. With this kind of review, your first grade students will have the support of an answer that’s supplied, but will still need to solve the problem to determine if the answer is correct. Plus, the practice is in a fun game format! 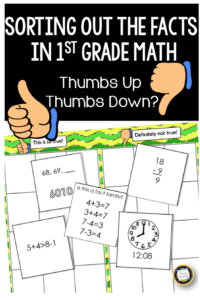 How can you use this Thumbs Up math game? 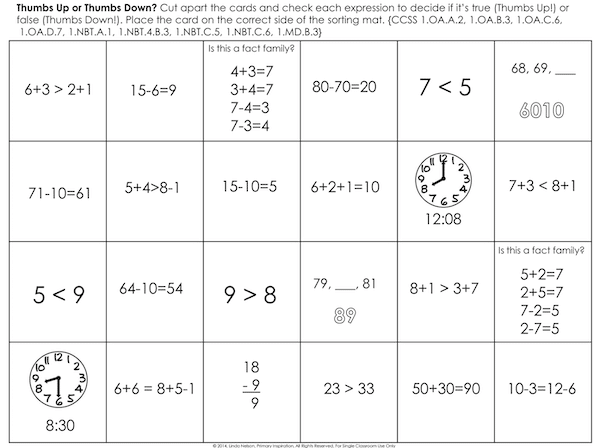 Thumbs Up games are a great addition to your math centers or math rotations. You can also play this game with your whole class on your document camera. Another alternative is to use just the cards with a small group. Your students will love to signal their response by showing their thumbs up or thumbs down! This sample game is a fun way to practice first grade skills, but it’s also great for review at the beginning of second grade, so you can get a quick peek at your new students’ skills. Click here to get your copy of First Grade Thumbs Up Samples! If you’re always looking for new ways to incorporate varied math practice into your day, you’ll want to check this post for a way to add a review game to your calendar time!